This book is intended to deal with substance rather than with form. But, in estimating the work of a teacher who taught exclusively with the pen, it would be perverse to disregard entirely the qualities of the writing which so penetrated and coloured the intellectual life of the Victorian age. 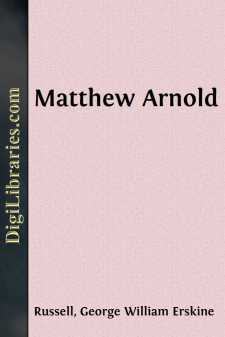 Some cursory estimate of Arnold's powers in prose and verse must therefore be attempted, before we pass on to consider the practical effect which those powers enabled him to produce. And here it behoves a loyal and grateful disciple to guard himself sedulously against the peril of overstatement. For to the unerring taste, the sane and sober judgment, of the Master, unrestrained and inappropriate praise would have been peculiarly distressing. This caution applies with special force to our estimate of his rank in poetry. That he was a poet, the most exacting, the most paradoxical criticism will hardly deny; but there is urgent need for moderation and self-control when we come to consider his place among the poets. Are we to call him a great poet? The answer must be carefully pondered. In the first place, he did not write very much. The total body of his poetry is small. He wrote in the rare leisure-hours of an exacting profession, and he wrote only in the early part of his life. In later years he seemed to feel that the "ancient fount of inspiration" was dry. He had delivered his message to his generation, and wisely avoided last words. Then it seems indisputable that he wrote with difficulty. His poetry has little ease, fluency, or spontaneous movement. In every line it bears traces of the laborious file. He had the poet's heart and mind, but they did not readily express themselves in the poetic medium. He longed for poetic utterance, as his only adequate vent, and sought it earnestly with tears. Often he achieved it, but not seldom he left the impression of frustrated and disappointing effort, rather than of easy mastery and sure attainment. Again, if we bear in mind Milton's threefold canon, we must admit that his poetry lacks three great elements of power. He is not Simple, Sensuous, or Passionate. He is too essentially modern to be really simple. He is the product of a high-strung civilization, and all its complicated crosscurrents of thought and feeling stir and perplex his verse. Simplicity of style indeed he constantly aims at, and, by the aid of a fastidious culture, secures. But his simplicity is, to use the distinction which he himself imported from France, rather akin to simplesse than to simplicité—to the elaborated and artificial semblance than to the genuine quality. He is not sensuous except in so far as the most refined and delicate appreciation of nature in all her forms and phases can be said to constitute a sensuous enjoyment. And then, again, he is pre-eminently not passionate. He is calm, balanced, self-controlled, sane, austere. The very qualities which are his characteristic glory make passion impossible.